and a small piece of walnut. So with some cutting, routing, sanding and gluing, I made one of these. Finish is spray lacquer .. which stinks to high heaven when applying. Fun little project. I am sure I’ll be making more. Thanks for looking. That is a great piece of work….I assume that you cut the ribbon curls with a scroll saw? Redoak, you are spot on. Scroll saw makes for fast work and a pretty smooth finish. Wish I had a scrap piece thaty big!!!! 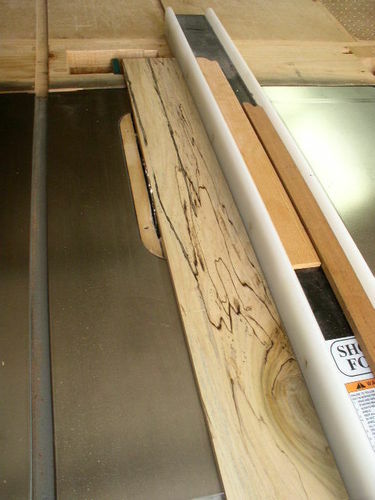 That spalted poplar, and of course, your work really touches that box off. Thanks for showing. Beautifully done, horky! Any words of wisdom regarding the spray lacquer and evenly finishing the bow? Thanks for sharing. Wow! What a gorgeous piece!! Great looking box. What size did you make it? thanks to all. the box is 6” x 6” x 4” H. When spraying the lacquer, I did not worry about really getting inside the bow pieces or under the curved part of the ribbon. Seemed like the over spray did what it needed to do to give sufficient coverage. I focused on keeping the very visual parts evenly coated. Again, all the curved parts were cut with a jig saw, no wood bending was involved.